Tempe Temptation! Spacious, accommodating, near freeway hub to all of Phoenix! 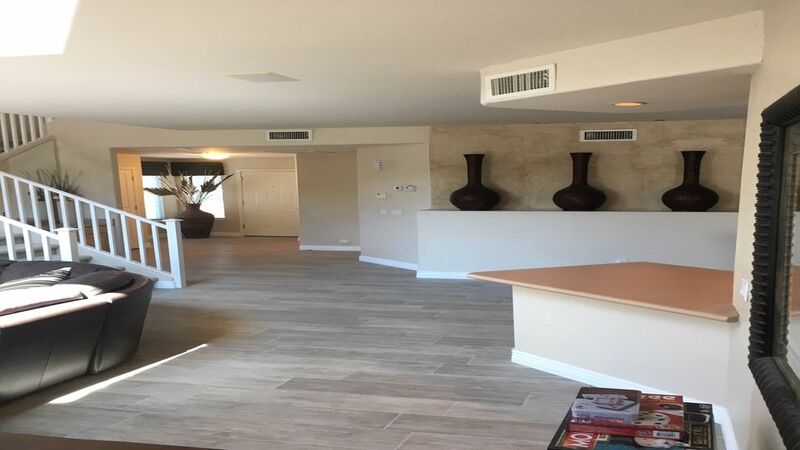 Reduced price for May/June + 1 night free - Contemporary, 2,355 Square Feet, 2 story luxury home in Tempe Arizona. Vaulted ceiling gives this home an open, airy, wonderful spa feeling! Super clean and well maintained. Home is located within a gated community. Master suite features a king size bed with tiled shower and separate soaking tub. Located minutes from 101 freeway with easy access to the 202/60/10 freeways. Activities abound and this home is minutes away from everything! Minutes away Tempe and Scottsdale downtown areas, freeway close to downtown Phoenix. Hop on Highway 10 and head east to Tuscon and Karschner Caverns. Hop on 101 and head north and you are on your way to Scottsdale, Sedona or where ever. Our previous guests have done it all, while enjoying the home's contemporary elegance, as will you! No disappointments here! Snuggle by the fire or take a hike along the canal. Relaxation and activities are in the offering! Masterbath is as large as a bedroom with abundance of closet space. Other full bath is located upstairs near loft and has tandem sink bowls. This is our favorite VRBO we have stayed in! This home was quiet, clean, tastefully decorated, practical, and safe in a gated community. The separate A/C units kept the second floor cool where the bedrooms are. The beds are firm and comfortable with great linens. (I had back surgery a year ago and am sensitive) Downstairs the great common area has great leather couch and a fully stocked kitchen. In the neighborhood are many conveniences including a Fry's grocery store. There is a park and canal walk also close by. I had read reviews about how wonderful and accommodating Manny the property owner was and it is all true! He went above and beyond to make our stay for our daughter's wedding a memorable one. We would rent this place again! Perfect house for our family vacation! Manny's place was perfect for our family of six plus toddler. We were there for a family vacation and to celebrate a family wedding. This house is convenient to freeways, shopping and all the venues for the wedding activities. The house is nicely furnished with a comfortable great room just of the kitchen, perfect for visiting and just hanging out. The Legends community is just off the busy streets of Tempe, yet feels miles away from all the chaos. We enjoyed the pool every day! Manny was wonderful to deal with. He responded immediately to our questions and requests. He made the arrangements for a high chair and crib for our toddler grandson, which were waiting for us when we arrived. We will definitely stay here again when we are back in the area. Nice House in a Nice Location! The house is nice and roomy and we enjoyed our stay there very much! The Master Bath is really nice, one of the best we've ever seen! Plenty of closet space in all the bedrooms, which are spacious and nicely decorated. The kitchen is very nice and is stocked very well! And the living room is large and comfortable. The Legends is a gated neighborhood and is well-maintained, quiet, and very safe. It's located near a shopping center that includes a grocery store, restaurants, and other businesses. And Hwy 101 is less than a mile down the road, so it's easy to get to where your going! Thanks Manny! We had a great time! The house is perfect for a family gathering! We thoroughly enjoyed our 2 week stay in Tempe! The house was perfect for a family gathering, with plenty of space and a well equipped kitchen. Even though it was winter, the kids swam in the pool, the adults enjoyed the spa, the BBQ grill came in handy, and access to trails was an easy 10 min walk from the door. Having use of a 2 car garage, plus a reserved parking space, was an expected bonus! The description of the house and amenities was accurate, and we are so glad we selected this rental over others. Thank you, Manny, for helping to make our trip a success! PS. There are plenty of towels now! Stayed here with 6 of my sister’s and it was great! We all enjoyed the home! Loved the area was easy to get around. I have rented a few Vrbo. But I have never been wowed!Manny was super to work with. Clean nice area will be back for sure. Only thing I can say was I wish there were a few tee towels for the kitchen. Haha.